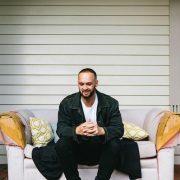 Australian native, Sammy Johnson (a.k.a Sammy J) embraces his Maori and Polynesian roots to create positive and uplifting music. Blending together island reggae, soul and jazz vibes with heartfelt lyrics, Sammy’s sound is exhilarating and intoxicating. Now based in the U.S., Sammy has seemingly exploded on the market selling out venues across the west coast and Hawaii. This can be attributed to his relentless hard work and dedication to his craft. Sammy Johnson has been waving the flag for the Pacific Island sound and has quickly become a leader of the scene alongside new school artists like J Boog and veterans like Katchafire. The Native-Kiwi-now-Los-Angeles-resident, Sammy J, got his big break via Youtube after his video for “Don’t Say Goodbye” became a viral sensation, racking up over 10,000,000 plays. Sammy who was working as a social worker at the time, made the decision to pursue music full-time following the newfound popularity of the song that soon become a staple of modern era Island Sound. Not too long after, a Hawaiian-based producer contacted him to work on an album and was offered a record deal with Island Empire Records, home to groups like Common Kings, Tenelle and Fiji. With his music spreading like wildfire, Johnson said his move to California in 2014 and musical quest to spread positive vibrations across the country has gone beyond what he could have ever imagined. Sammy J has released two full-length albums, his debut “Prelude’ in 2013 and an self-titled album in 2014. In 2016, he returned with a brand new EP entitled “Lion Roar” on Island Empire, which debuted on the Billboard Reggae charts in America. Sammy quickly capitalized on the success by embarking on a sold-out tour across the country with labelmates, Common Kings. With a powerful fan following, Sammy Johnson returned to New Zealand at the tail end of 2016 as one of the headliner’s of One Love Music Festival and captivated the crowd of over 15,000 in attendance.